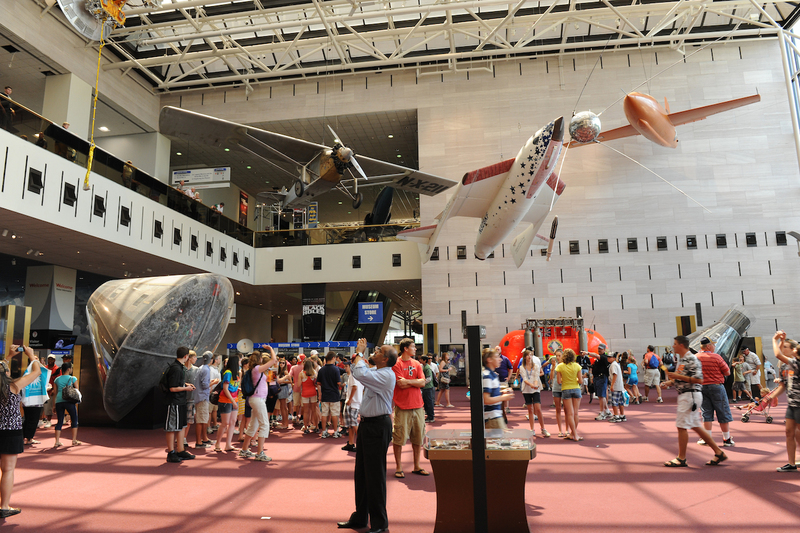 NASM’s press release continues… The expanded [Milestones of Flight] exhibition will trace the interconnected stories of the world’s most significant aircraft and spacecraft, with digital displays and a mobile experience in a new design that stretches from one entrance to the other, Independence Avenue to Jefferson Drive (National Mall). 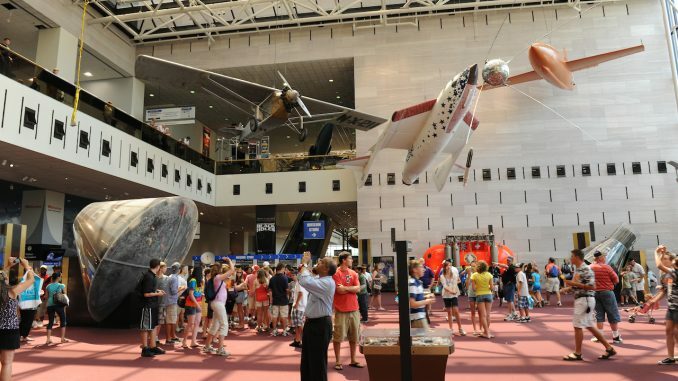 In appreciation for the gift, the museum will rename the gallery the “Boeing Milestones of Flight Hall.” Boeing has made numerous other gifts to the Smithsonian during the years, in excess of $64 million total, with $58 million to the National Air and Space Museum. One of the exhibition spaces at the museum’s Steven F. Udvar-Hazy Center in Chantilly, Va., is named the Boeing Aviation Hangar. The Milestones exhibition, which is the museum’s central and largest space, has looked much the same since the museum opened July 1, 1976. More than 310 million people have passed through the exhibition during the museum’s 38 years of operation. The new installation will give the hall a streamlined “21st century” look and features themes and displays suited to today’s visitors. The square footage of the exhibition will be enlarged and the displays will take full advantage of the atrium’s two-story height. In reenvisioning and renovating its Milestones exhibition, the museum aims to deepen visitors’ understanding of how aviation and spaceflight have transformed the world. Since humans learned to fly, transportation has gotten faster and distant places more accessible. Advances in planetary exploration have made the universe seem larger, altering humans’ ideas about themselves and the world. When the museum opened nearly four decades ago, the word “milestone” was defined as “the first” in flight or space travel. Now, the word will describe an artifact having significant or widespread cultural, historic, scientific or technological impact. Key artifacts in the expanded hall, selected because they tell multiple stories, will be organized to connect themes. Some of the objects, such as the Ryan NYP “Spirit of St. Louis,” the Bell X-1 “Glamorous Glennis” and Mercury “Friendship 7,” will be familiar to visitors because they already reside in the gallery. But other icons-the huge Apollo Lunar Module, for example, the Telstar satellite and the model of the “Starship Enterprise” used in the Star Trek television series-will be surprises. One of the most engaging differences will be the addition of a media wall and kiosks, which will enable visitors to view artifacts in different contexts, look them up by topic or theme and connect to other sources of information. A new sign system will help visitors find other artifacts and galleries more easily, and a larger, more centrally located Welcome Center will allow the museum to assist larger numbers of visitors more quickly and efficiently. In addition to the Milestones project, the Boeing donation will fund upgrades and enhancements for several other galleries, including the museum’s “How Things Fly” gallery, where children learn about the science and technology of flight through imaginatively designed displays staffed by high school and college students called “Explainers.” In the gallery, children are encouraged to climb into the cockpit of a small airplane, make paper airplanes and view live demonstrations. The funds will provide for a new educational program, based on the role innovation and technological change plays in the progress of aviation and space development, as well as support the museum’s John H. Glenn Lecture in Space History, an annual event. The museum will develop live broadcast and Web programs for students, as well as webinars and an annual event for children and families. It will offer an accredited professional development course for teachers and students.